Totally unique accommodation, delicious English country food and nostalgic seaside fun. 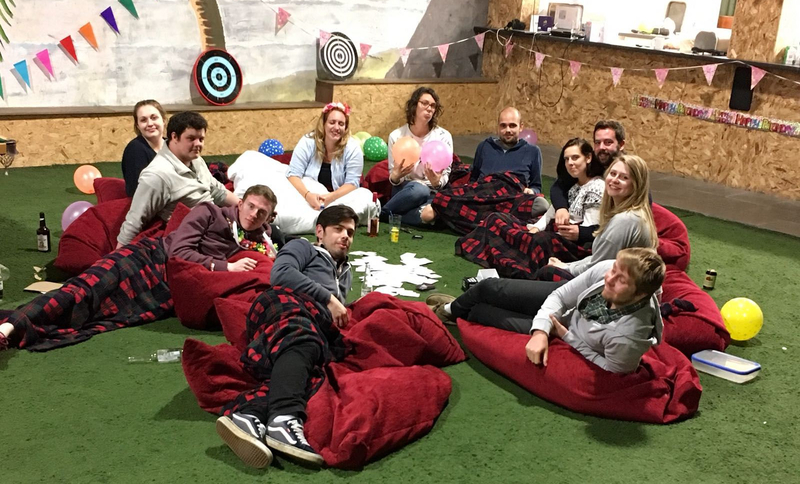 The Lane Barton Leisure Barn in North Devon is a slightly crazy but extremely fun holiday for friends or families. 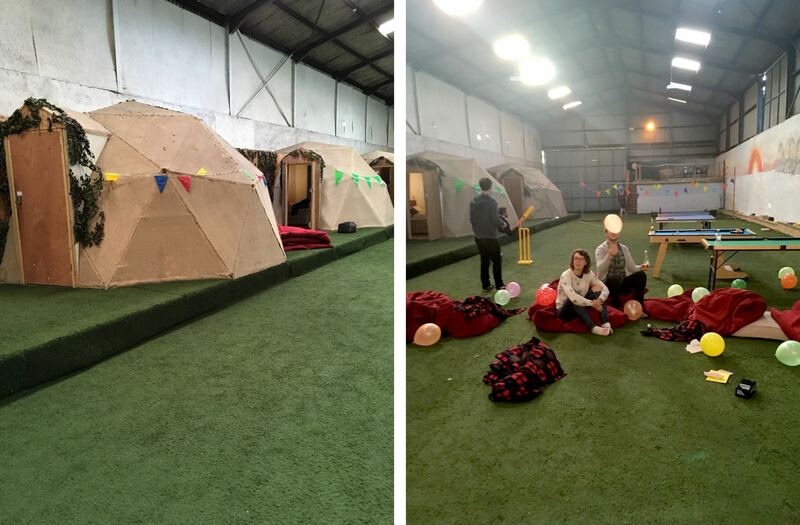 Described as an all weather glamping experience for groups, families or friends, Lane Barton Leisure Barn is without a doubt the most extraordinary place I’ve ever stayed for a holiday. We had a couple per pod but each was fitted for a family of 4! A converted cow shed on a farm in the small village of Woolfardisworthy, it has 5 “geodesic pods”, sleeping up to four if you include the double bed and the two truckle beds on the floor of each one (we didn’t need these as there were only 12 if us). The pods have their own heating, ensuite shower and toilet, and if that wasn’t enough, they come fully equipped with remote controlled rainbow led mood lighting. 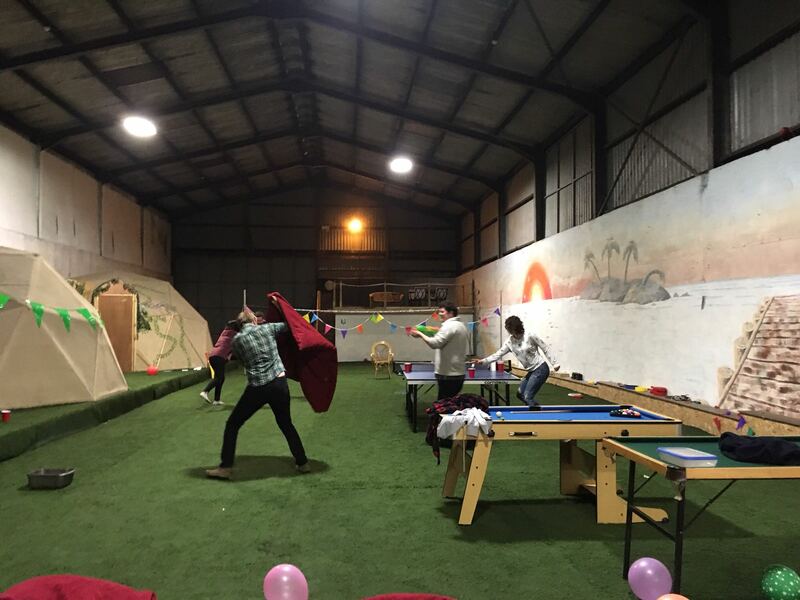 The rest of the barn is taken up with a massive astro turf play area with a badminton net and rackets, garden games (eg giant jenga), table tennis, darts, snooker, and water pistols. Who knew bean bags made such good shields in a water pistol fight? There’s also a structure in the corner of the barn that holds a fully equipped kitchen with multiple fridge freezers, ovens and dishwashers. Handily the kitchen actually opens out into the main play area, so you can use it as a bar or buffet station. 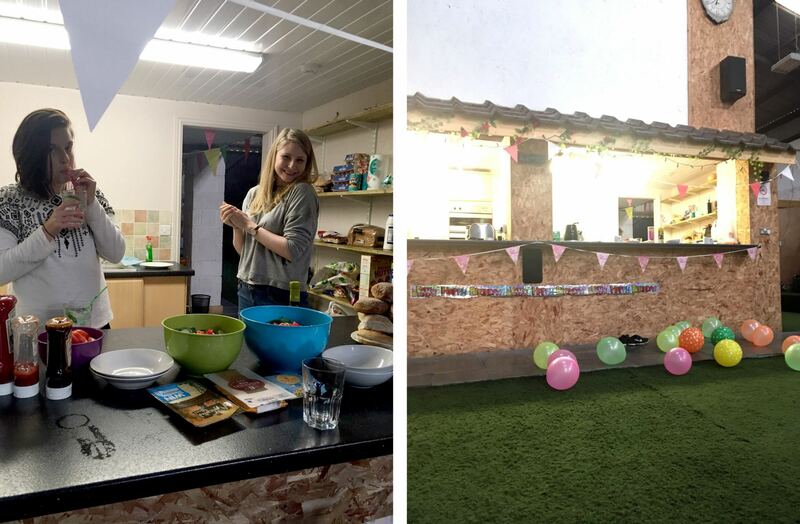 Celebrating Kerry’s birthday with balloons, bunting and burgers. The new structure also holds a dining room that seats 32 (!!!) and a living room with sofas and a TV. But why would you need that when there’s a projector in the ceiling that beams your laptop screen onto the barn wall so you can watch from a bean bag? We booked it on Airbnb, but you can also find it on Tripadvisor. Playing Cards Against Humanity on the astro turf. We stayed here for a long weekend last summer, and it was the perfect home base to explore the local towns and villages. Turns out Woolfardisworthy and Woolsery are actually two names for the same village! And it is gorgeous – classic British country side village, complete with church, convenience store and fish & chips shop. 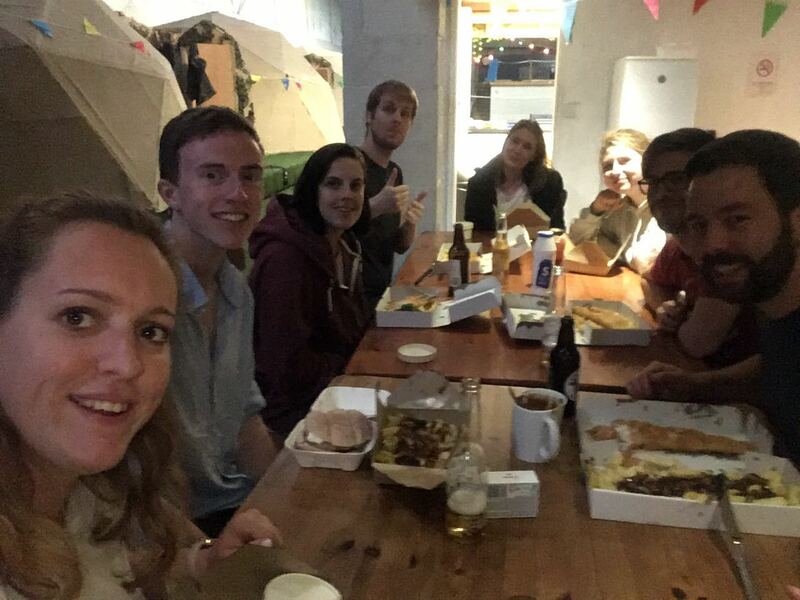 Our first night in the barn a small group of us drove into Woolsery and put orders in for 10 people at the Fish & Chip shop that had been recommended by our airbnb host. The place was clearly very popular and we had to join a queue of hungry locals before ordering. The food turned out to be delicious, and just what we needed on that chilly night. That brown stuff on the chips is basically pure Bisto, because Max and Alan are disgusting. You can’t go to this end of the country without having a cream tea. To get to the cafe in Merry Harriers you have to walk through a huge warehouse of garden paraphernalia, from solar powdered lanterns to fake decorative shrubs. My grandad would have loved it. The decor was exactly what you would expect, and the service wasn’t amazing, but holy cow the cream tea was an absolute dream. Fresh buttery scones, sweet homemade jam, thick clotted cream… delish. This lovely pub was everything we needed – warm, full of local cider, and with a massive menu of huge portions. We all ordered filling countryside comfort food – baked camembert, fish & chips, burgers – and rounded off the night with desserts. Yum. 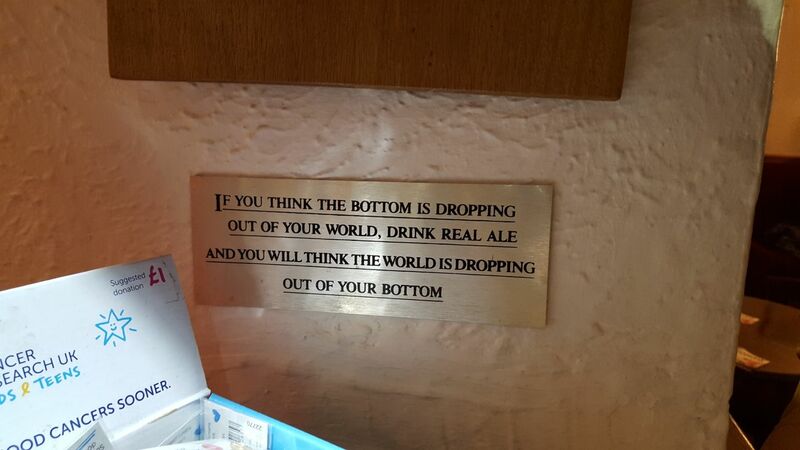 Classic countryside pub humour from The Thatched Inn. 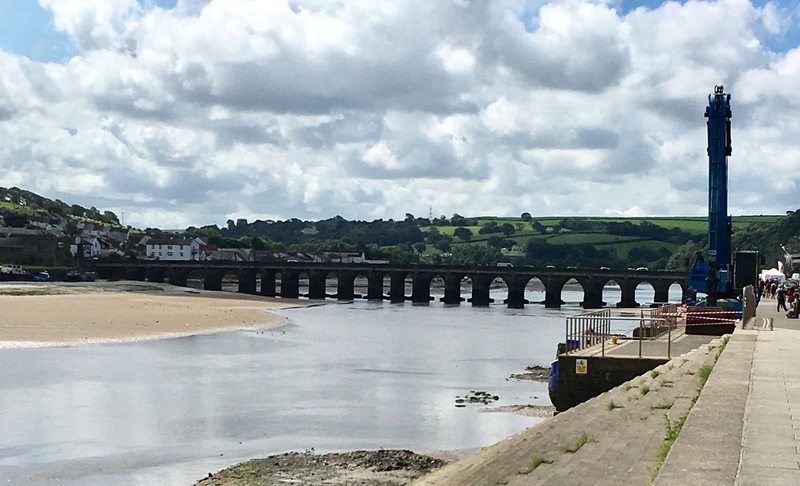 A historic port town on the estuary of the River Torridge, Bideford is well worth a day trip with its winding streets and picturesque green hills, cute cafes and cosy pubs. When we ventured into the town we were pleasantly surprised to find a market being held by the docks, with some amazing food smells wafting from the tents. Highlights included the Paella and the Tartiflette, which was just so creamy and buttery that Deco and Beth actually went back the next day for more (and were bitterly disappointed because, bummer, it only opens on Tuesdays and Saturdays). Enjoying tartiflette and paella from the market. Matt and I took shelter in this cute little cafe on the highstreet when the weather was particularly horrendous. The service was great and the food was very tasty! 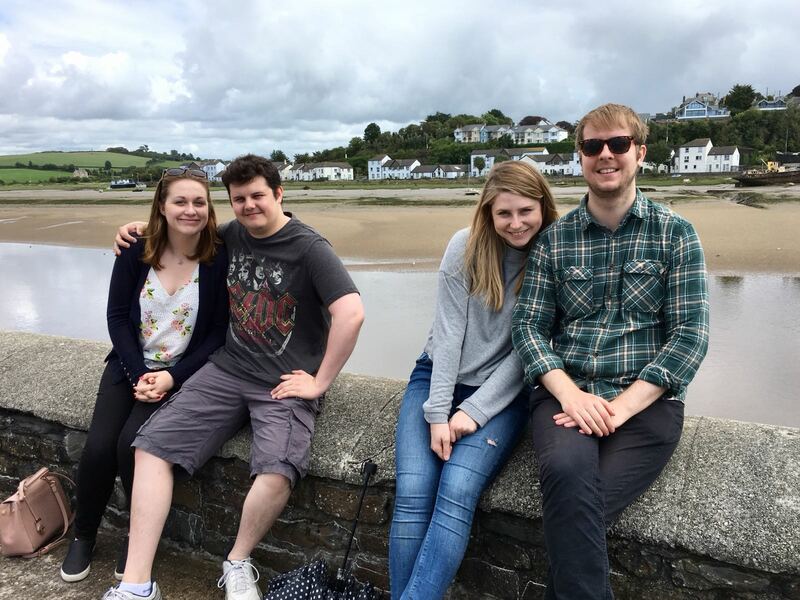 The Brew cafe in Bideford was sparkling new when we visited. We were so desperate for a coffee that we actually waited outside the door until they opened. 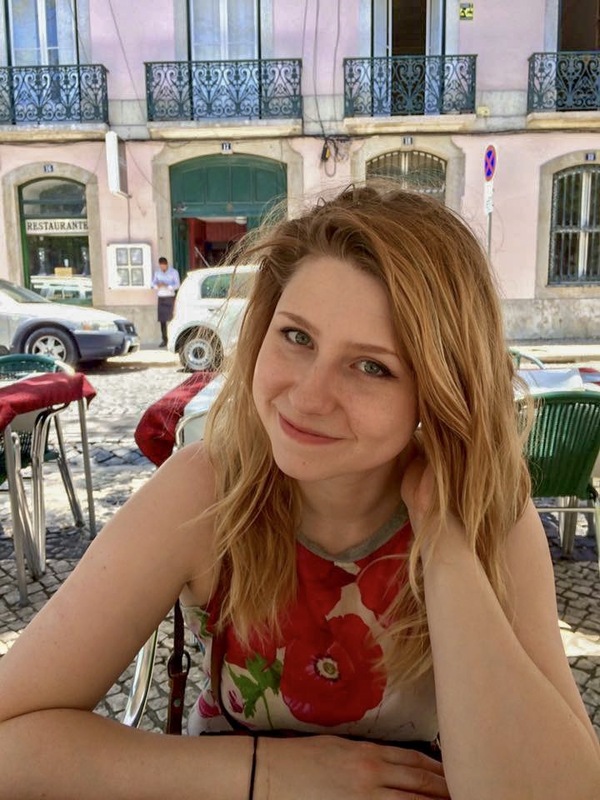 They clearly knew what they were doing – the coffee and cakes were very good. Great for a classic day at the beach, and even if the weather isn’t perfect there’s still plenty to do. Rent a surf board and wet suit, pig out on hot dogs and candy floss, or go for a walk along the pebbles. On our day trip to Westward Ho! 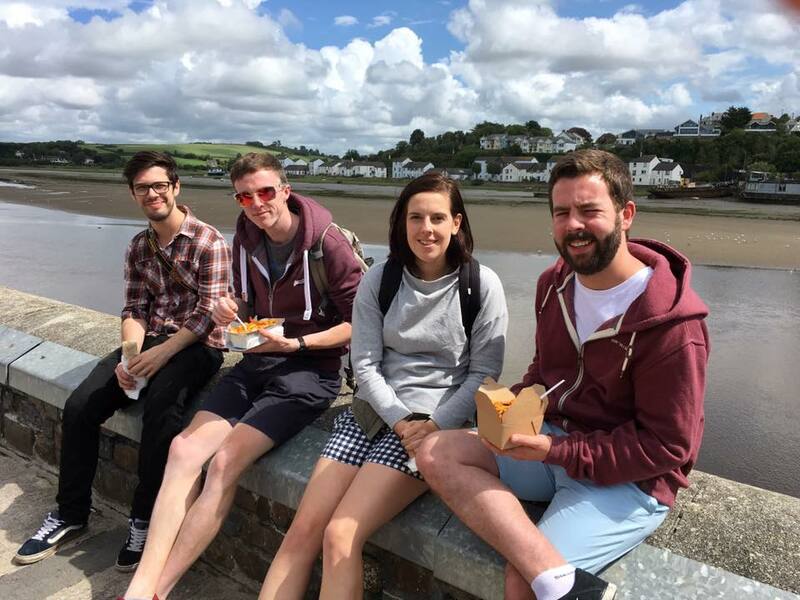 we did just about every beach activity available – ice cream, pretzels, surfing, and crazy golf. It was good clean nostalgic fun, and challenging enough for everyone to fire up some competitive spirit. Pebble Ridge also does Go Karts and a bunch of other seaside activities. The Adventure Golf was £4 each. 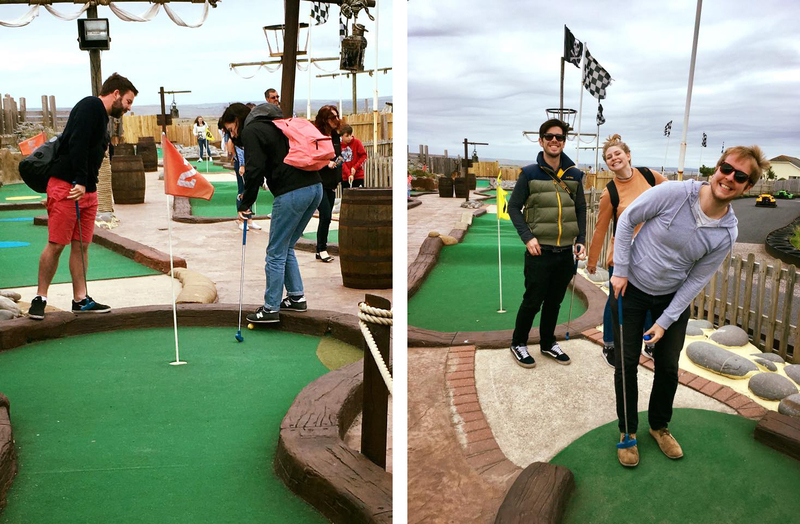 Crazy Golf is a serious business. When we first got to Westward Ho! the weather was less than ideal, so we sheltered in the Fairway Buoy (a bar/cafe that looked slightly like a stranded ship) while we waited for the others to return from surfing. The sofas upstairs were the perfect place to chill out with a cup of tea and watch the waves. There’s no way around it, you just definitely need a car. The nearest supermarket is a 20 minute drive away, and there were no buses that we could see. 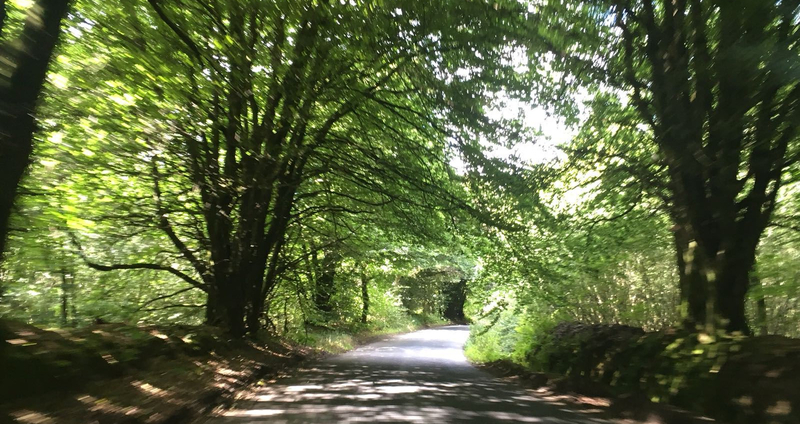 The roads were very pretty though, so once you’ve driven down to Bideford it’s definitely a walking/cycling kind of destination. The roads around Woolsery went through some very dense woodlands and would be great for cycling. The weather was pretty dicey while we were there in August. Some of the boys cracked out their shorts but you definitely need a jumper and umbrella on hand. The barn was quite chilly sometimes but there was a big supply of blankets, and the pods had their own heating, so sleeping wasn’t an issue. This was a great destination for a group trip, and would definitely work for a big family holiday or a hen party. Especially if you want to tire out the young’uns. 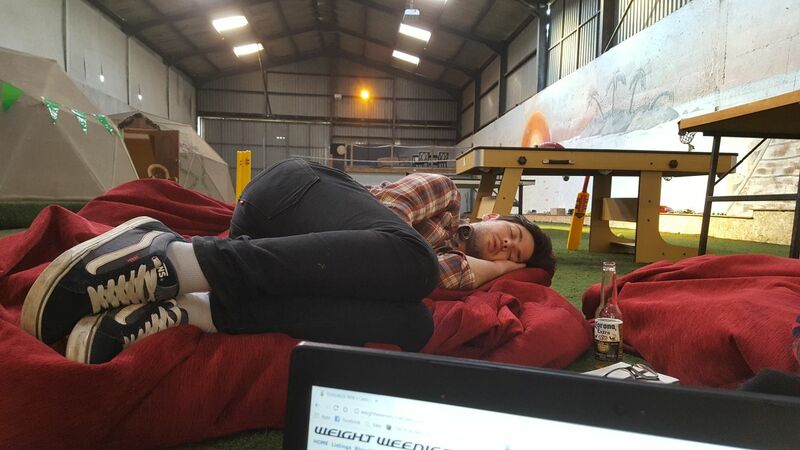 Dan’s had a long day. Photo credits go to Sarah and Kerry!